Here to tell us more are Mark Prezorski, Olana’s Landscape Curator and Galen Joseph-Hunter, Executive Director of WGXC. All the Raj - Frederic Church and Lockwood de Forest; Painting, Decorating and Collecting at Olana, is a new exhibition featuring oil sketches and decorative arts by landscape painter and 19th century tastemaker Lockwood de Forest. The exhibition will open at Olana, the historic home and studio of Frederic Church in Hudson, NY this Sunday May 11. Lockwood de Forest studied painting with his great-uncle the eminent landscape artist Frederic Church in the 1870s; the exhibition will begin by highlighting sketches showing that the two artists worked side by side at Olana. At that time, Church was busy designing and building the main house, and the young de Forest watched Church draw inspiration from books on Persian and other exotic architecture. Here to tell us more are Olana Curator, Evelyn Trebilcock and Dr. Roberta Mayer – a premier authority on de Forest, Dr. Mayer is an art historian and professor at Bucks County Community College. The Clermont State Historic Site in Germantown, NY was the Hudson River seat of New York's politically and socially prominent Livingston Family. Seven successive generations of the family left their imprint on the site's architecture, room interiors and landscape. Robert R. Livingston, Jr. was Clermont's most notable resident. His accomplishments include: drafting the Declaration of Independence, serving as first U.S. Minister of Foreign Affairs, administering the oath of office to George Washington, negotiating the Louisiana Purchase and developing steamboat technology with Robert Fulton. 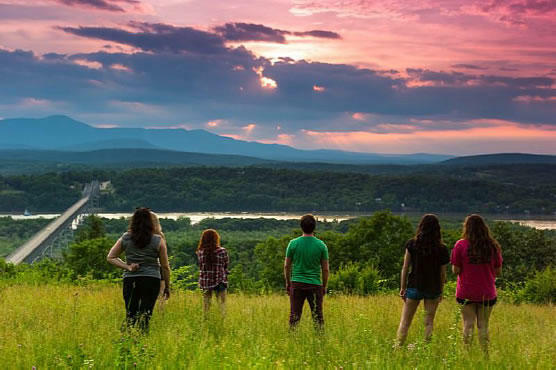 The Hudson Valley is known as an arts destination and the art communities along the Hudson River are known for their Art Days, Events and Studio Tours. The groups that represent the art towns and the art celebrations joined together 11 years ago to form a marketing collaborative effort to bring focus and awareness of their art activities. Art Along the Hudson represents over 1000 artists, 400 studio tour participants, 250 art venues, 150 art festivals and community events – plus art receptions, performances, exhibits, and more. Joanna Hess, co-chair of Art Along the Hudson and Albert Shahinian, owner of Albert Shahinian Fine Art in Rhinebeck and co-founder of Art Along the Hudson join us to tell us more.